heads of the Federal and regional government bodies, responsible for ecological policy and ecological control. Journal of Industrial Ecology (Russia) offers to the reader information and technological support in the field of industrial ecology. Journal will help to set up the main lines and stages of the practical activities. scientists from institutions investigating ecological problems in industry. Journal Industrial Ecology (Russia) is distributed by subscription and by mail order over all the territory of the Russian Federation and in some of the FSU countries. Circulation of the each issue of the Journal in 2009 is 10,000 copies. 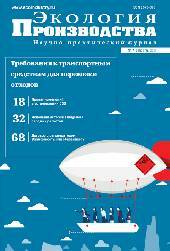 The Ministry of natural resources and ecology of the Russian Federation and Publishing House Industry Newsletter express their confidence that new journal “Industrial ecology” will be useful for interested organizations and persons. Our address: Russia 107113 Moscow, P.O.B. 68.